Reflections: Then & Now and everything in between - Adventures with the Tuleys! I am so excited to take the challenge of writing for 31 days! I had this goal set last year when I went to the Declare Conference, but haven’t made the time to do so. I heard about this challenge after attending the Declare Conference again in August and decided that now is the time! The timing of 31 Days is perfect, because it falls in line with the fact that everything we went through with Josiah happened exactly three years ago. I hope to reflect upon the last three years, and share what we’ve been through. Some posts may be old hat to many of you. But hang on, because there are some things you haven’t heard; I’m hoping to share some of the struggles and real-life that happens around here – more so than the usual. While at Declare in August, I felt God calling me to go deeper. It’s written all through my notes, so it was hard to miss! To go deeper not only with Him, but with others as well. This is a scary thing to do, but I want to share with you a section of notes I took during the last keynote session with Chrystal Evans Hurst. This challenge is not about me, but about Jesus. I want to allow myself to write despite my fears, to be bold enough to share my pain, to be brave, and to share so that others may come to know Him! I hope you’ll join me as I reflect on the last three years; from diagnosis, to brain surgery and hospital stay, through chemotherapy, a year off of treatment, and where we’re at today. October 9 – What can I do to help? November 3 – What Now? I found you through Write31Days. I look forward to following your journey and seeing how God has moved in the midst of it. Blessings! Thank you! I’m excited, and hope it blesses others in the process and ultimately brings God the glory! 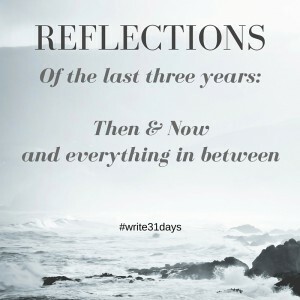 I also found you through Write31Days and will be following your journey. Thank you! It’s given me a bit of a challenge to write to new readers as well as those who were there journeying with us, but I’m super excited to see where it leads!